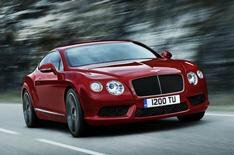 Bentley Continental V8 models revealed | What Car? Bentleys new Continental V8 models have been unveiled ahead of their public debut at the Detroit motor show in January. The new versions of the Continental GT coupe and recently launched Continental GTC convertible have a new 500bhp, twin-turbo 4.0-litre engine. The engine is mated to a new eight-speed automatic gearbox and uses variable displacement technology, where four of the cylinders shut down under light throttle pressure, to reduce fuel consumption and CO2 emissions. Bentley hasnt released any figures yet, but it has confirmed that the new models will be able to travel more than 500 miles on one tank of fuel. The V8 versions are also 40% more economical and emit 40% less CO2 compared with the Continental 6.0 W12 models. Visual changes for the V8 cars include bespoke interior and exterior trim. Prices are yet to be announced, but wed expect them to significantly undercut those of W12 versions. The Continental V8 models go on sale in early 2012.